What’s the Difference Between Canoeing, Kayaking and Packrafting? NB: As Nature Travels experiences use Canadian canoes and sea kayaks, the article below focuses mainly on the difference between these. We do not currently offer tours involving whitewater or kayaking on rivers, so whitewater kayaks are not discussed. 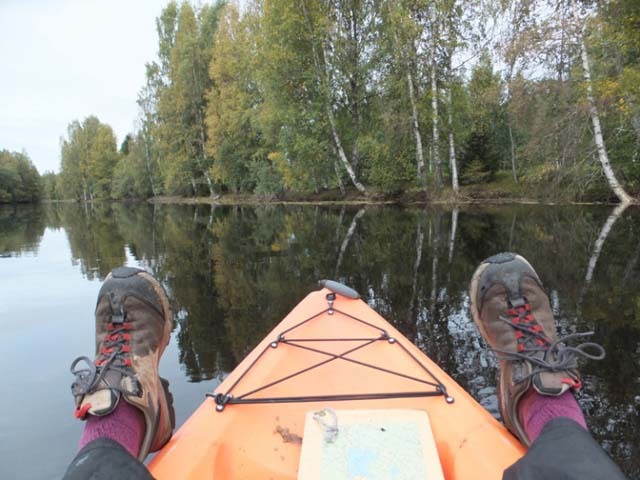 Nature Travels offers many paddling adventures in the Nordic countries and there are a few ways to get you across the water on our multi-day trips. Those who are new the outdoors can find the difference between these confusing, so what is the difference between canoeing and kayaking? 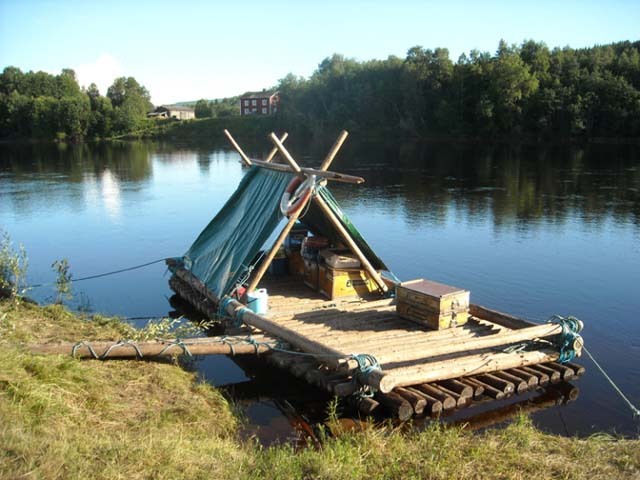 And what about packrafts, or even timber rafts? When looking at the competitive world of canoe and kayak racing, the boats look very similar and these can be easily confused when watching the Olympics, but they are quite different when used recreationally. Letting go of your paddle is not recommended! Photo: Sofia Nature Travels. Kayaks are slimmer, have an enclosed cockpit that you sit in and you store your belongings in the closed compartments at the front and back of the kayak. 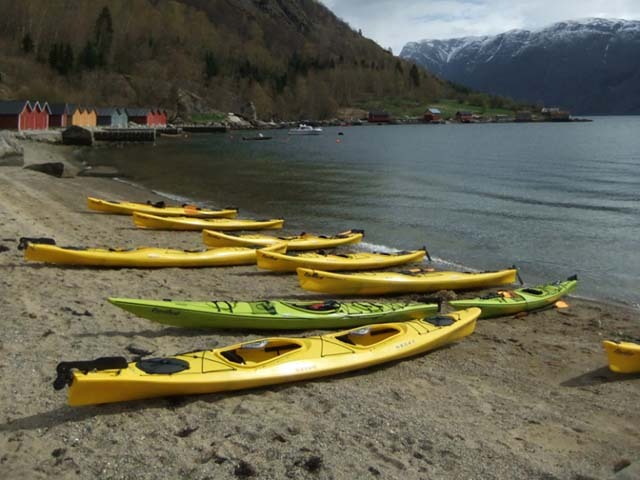 There are single (K1 – one person) and double (K2 – two person) kayaks available. Double kayaks are the most stable option and we would recommend these for novice kayakers. Courses are often available as optional extras if you want to gain some confidence before setting out on your first multi-day self-guided kayak adventure! Kayak paddles have two blades, and you paddle with alternate strokes on each side of the kayak. 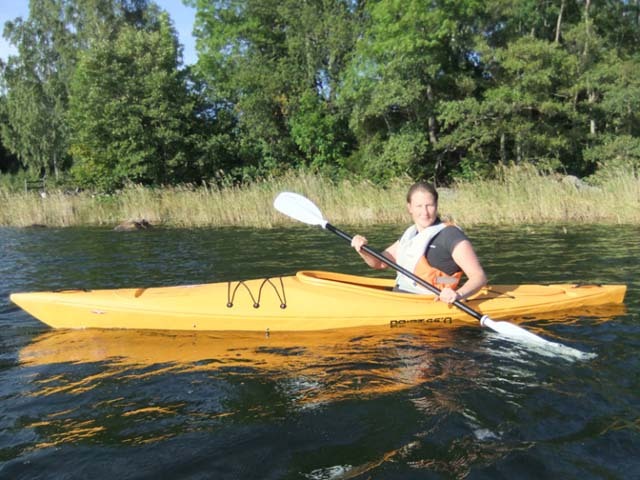 Sofia taking a tour from our summer house in the Stockholm Archipelago using a simple single sea kayak. Photo: Bob Nature Travels. 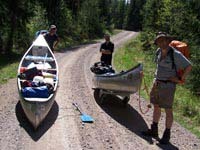 Canoes or “Canadian” canoes look more like a boat, have an open deck that usually fits 2-3 persons plus your luggage. They’re usually around 5m in length and there’s a lot of storage available with a carrying capacity of around 350-400kg. Canoe paddles have single blades. 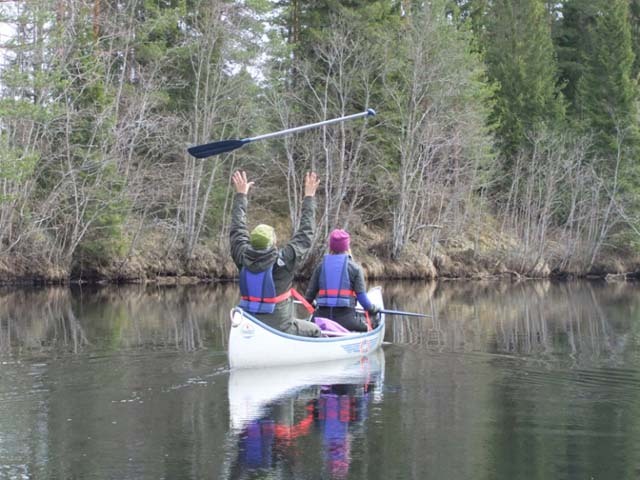 If you’re paddling two persons in a canoe, you will normally have your paddle on the opposite side from your partner, changing over when you get tired! Canoes can be easily transported over surfaced tracks by the use of a canoe trolley, included as standard for many of our tours. Photo: Bob Nature Travels. Storage in canoes is often in 60 litre pack barrels or, if you don’t get a trolley to assist with the land transports due to the terrain, you should pack things in backpacks so you can carry the canoe and your backpacks together, saving time instead of making multiple trips. Double kayaks offer a good amount of storage and are very stable. Photo: Nature Travels. Single kayaks have around 150 litres of total storage space, while double kayaks have around 200 litres. Storage is limited, so pack you things in soft, waterproof bags. The storage compartments will keep most of the water out but are not intended to be completely waterproof. Typical paddles for Canadian canoes. Photo: Niki Nature Travels. 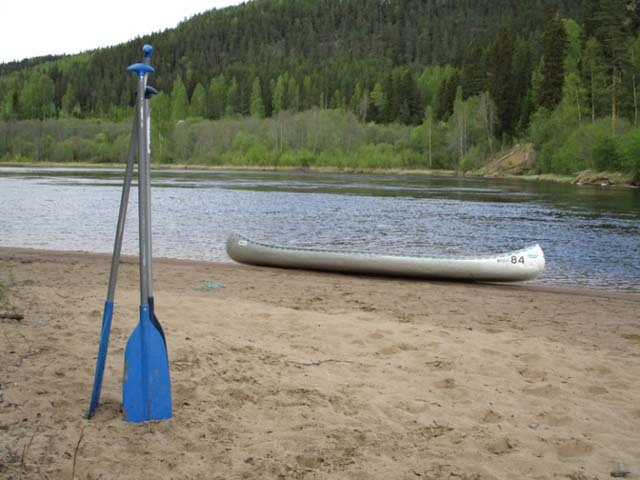 To ensure you’re comfortable during your trip, we would recommend packing things in drybags and you can usually leave anything you don’t want to take with you on tour at the kayak/canoe centre. Sit-on-top kayaks are a good option for odd-numbered persons in a group for some of our canoe tours. Luggage can be carried in one of the canoes. Photo: Sofia Nature Travels. For some of our canoe tours, when travelling in an odd-numbered group you can chose to either travel as 3 in one canoe or the 3rd person can use a sit-on-top kayak. These are fun to paddle but not useful for multi-day tours on their own, as there’s nowhere to store your belongings, so you would keep your things in the accompanying canoe. 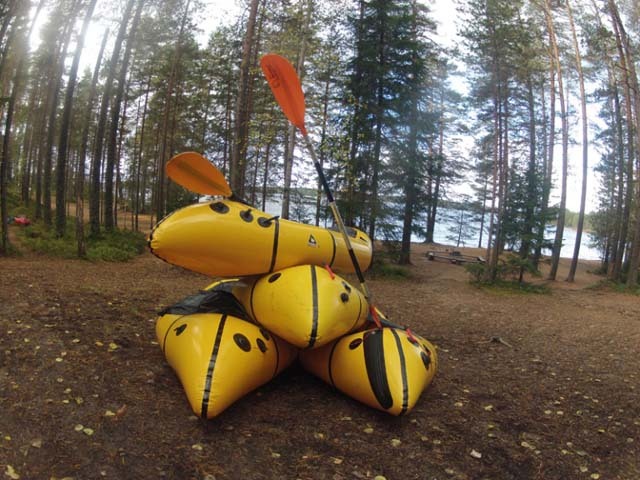 Sea kayaks are generally faster and used in more challenging waters and are ideal for exploring the archipelagos of Stockholm, Helsinki and West Sweden. Canoes are meant for a meandering paddle, taking in the scenery and softly splashing your way through rivers and lakes. In a canoe you are seated with bent legs and use the one-bladed paddle to propel you along by holding the top grip and pushing down through the water. You have a lower centre of gravity in a kayak, as you are sat with your legs out in front on you and both blades enable you to move more quickly through the water. Its portability makes the packraft ideal for use in areas which require a number of land transports and allow you to access new areas. Photo: WH. But canoes and kayaks are not the only ways to get around on the water! 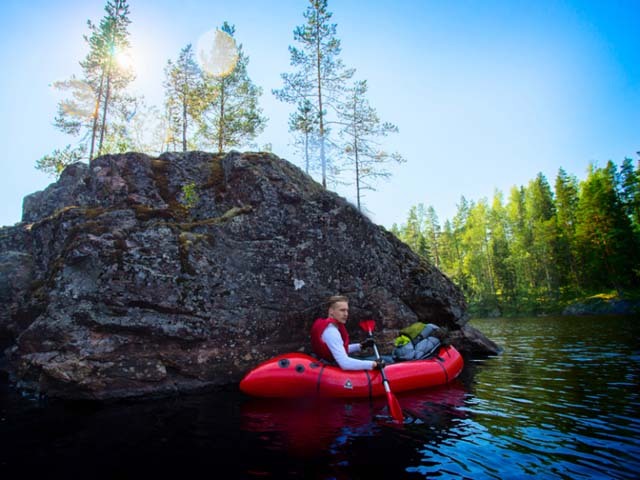 The landscape in which Discover Packrafting in Helvetinjärvi National Park takes place is one which would be cumbersome to explore by canoe due to the land transports required, so packrafts are an ideal choice. A packraft is a lightweight, inflatable raft that can be easily inflated for paddling and deflated for land transports or short hikes. 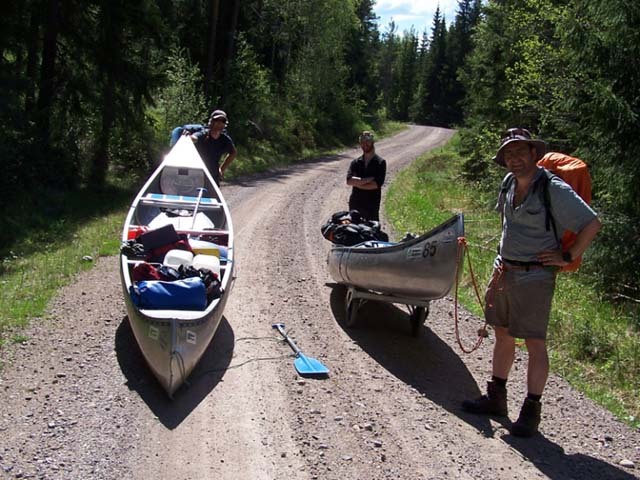 Packrafting is a fun way to spend a few days on the water and can be easily combined with hiking between the lakes. Photo: WH. It’s almost a combination between the two, as you sit with your legs in front with a kayak paddle but it has an open deck, like a canoe. While a packraft cannot cut through the water as efficiently as other craft, packrafting has in some ways the best of both worlds and offers the flexibility to explore on the water until you’re ready to come ashore – then you just deflate and go on foot! Timber rafting is a great alternative to canoeing to enjoy a few days on the water. Photo: Stephen Le Beau. Another water-based way to explore is Timber Rafting. Here your pole will be the main tool to push you in the right direction, though there’s also some paddling involved, especially when it’s time to land or avoid a sandbank – but that’s a whole other ball game! See our separate article on building a timber raft for more information on the wonderful world of timber rafting! The most important thing is that you’re out on the water, which gives a new perspective you don’t get from land-based activities and, with the added bonus of wild camping, is a real outdoor adventure for all to enjoy!